Learn how to play Fingerstyle Instrumental – Castle On A Cloud note-for-note on guitar. This video contains the performance play thru video from my lesson on Castle on a Cloud arranged for fingerstyle guitar. It will let you know if you like the piece and give you some sense of the degree of difficulty. The full lesson contains this play thru video, a complete lesson video, and full tabs. You’ll receive a link to download it as a zip file of 182mb, containing all the lesson content. Very nice. I’ll purchase this. Just curious about your thumbpick. I’ve been playing a long time and use a flat pick and I also fingerpick for classical and some easy listening pieces. 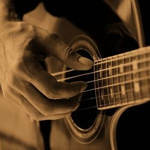 There are some tunes where fingerpicking is desired in some parts but also perhaps some fast runs or scales using a pick. Somehow I am unable to do this with just my thumb and these days I do not have the agility in my fingers to use alternate p and i for runs, scales and such (like I might’ve as a younger guy). Maybe a thumbpick is the answer allowing me to do both? Anyhow, I have tried some thumbpicks but they seem too long – putting my thumb quite far from the string and really altering how my muscles / habits must adapt. The one you use in this video seems quite short by comparison. I’d be interested in knowing what you use and if you cut it to the length shown. Hi Roger. I use a Fred Kelly Delrin Speedpick. I don’t file it but you certainly could if you wanted it to be shorter. I have no classical guitar training. Learning to play this has been a huge achievement for me. Can it sent the PDF file to my email address instead post to billing address after paid? It will be sent as a download link to your email address. We won’t send anything to your billing address.